Sectarian Sunni versus Shia relations in the Mideast have worsened significantly in the last year, largely driven by Iran's support of the Syria's genocidal Alawite president Bashar al-Assad, who for five years has been conducting a war of extermination against his own Sunni citizens. The Hajj takes place each year in Mecca, in Saudi Arabia. It's Islam's holiest event, commemorating rituals that date back to the prophet Abraham, and then codified by the prophet Mohamed in the Quran. Each Muslim is required to make a pilgrimage to the Hajj at least once in his lifetime. Last year, about two million Muslims from 180 countries around the world arrived in Saudi Arabia for their once in a lifetime Hajj pilgrimage. This year, the dates of the Hajj are September 9-14. 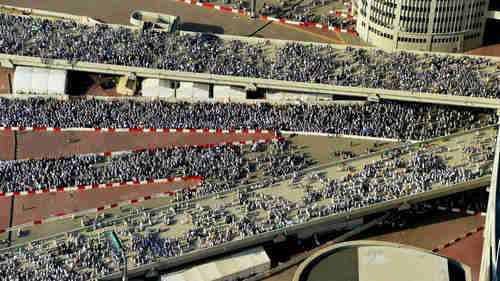 The stampede caused the death of at least 769 pilgrims, of which 464 were Iranians, according to the Saudis. There have been claims that up to 2,200 pilgrims were killed in the stampede. From the beginning, Iran called the stampede "a crime," and demanded that the Saudis be prosecuted in international courts. The Saudis said that the stamped was cause by Iranian pilgrims "not following instructions." After the firebombing of the Saudi embassy in Tehran, Saudi Arabia and Iran broke diplomatic relations. Other Saudi allies followed suit. In January, the Saudis halted trade and airline flights with Iran. Since Iran burned down the Saudi embassy in Tehran, there's no place for an Iranian citizen to go to get a Saudi visa. Since the Saudis have banned Iran's Mahan Air from traveling to Saudi Arabia, there are no direct flights between the two countries. So the Saudis have proposed a workaround: Any Iranian citizen who wants to attend the Hajj can fly to the United Arab Emirates (UAE), get a Saudi visa in Dubai, and then fly from there to Mecca. Since hundreds of Iranians were killed in the stampede that occurred in last year's Hajj, and since Iran says that the Saudis are guilty of a criminal act, Iran is demanding that they control the security and transport of Iranian pilgrims to the Hajj. Iran is demanding that a way be found to grant Iranians visas inside Iran. Iran is asking that the Saudis issue visas through the Swiss embassy in Tehran. Iran is demanding that transport arrangements for Iranians be evenly split between Saudi and Iranian airlines. Hundreds of thousands of people took to the streets across France on Thursday to protest the government's proposed labor reform bill. In Paris, protests descended into violence, with protesters throwing projectiles and police firing bouts of teargas. Across the country, rioters blockaded roads and oil refineries, resulting in a shortage of petrol. France has the shortest legal working week in Europe, at 35 hours. The 35 hour work week would be kept, but the new law would make it easier for employers to lay people off. Layoffs are currently almost impossible in France, but the reforms would allow companies whose revenues have fallen for four consecutive quarters to lay people off. France has a 10.5% unemployment rate, compared with 5.4% in the UK and 4.8% in Germany. Most observers blame France's high unemployment rate on the fact that employers are reluctant to hire anyone, especially young people, since it's almost impossible to fire them if they're incompetent. According to reports, the far-left activists calling for the strikes and riots feel betrayed because the labor reforms are being proposed by France's Socialist president François Hollande who, they feel, should completely support the far left.